Hi everyone. Friday has arrived again. I am ready for the weekend. It was a choppy week for me. I took a day off to go to a funeral, and another day we had testing at school. With some light morning snow the roads were terrible yesterday driving to work, and I had a birthday dinner another evening. No wonder why it felt like the week flew right by. This weekend I have a bridal shower to attend on Sunday and my daughter is coming home (since she is going to the shower with me), so this weekend will fly right by also I am sure. I guess all the events are good since there's no spring weather to enjoy yet and it's keeping me busy enough not to let the weather get under my skin too much. And all and all it wasn't such a bad week. All those events keep you on your toes for sure. So thought I would share a couple of weeks of my calendar art. My calendar is also a coloring book (coloring calendar) and I have done a little art on the pages that are next to the calendar itself. 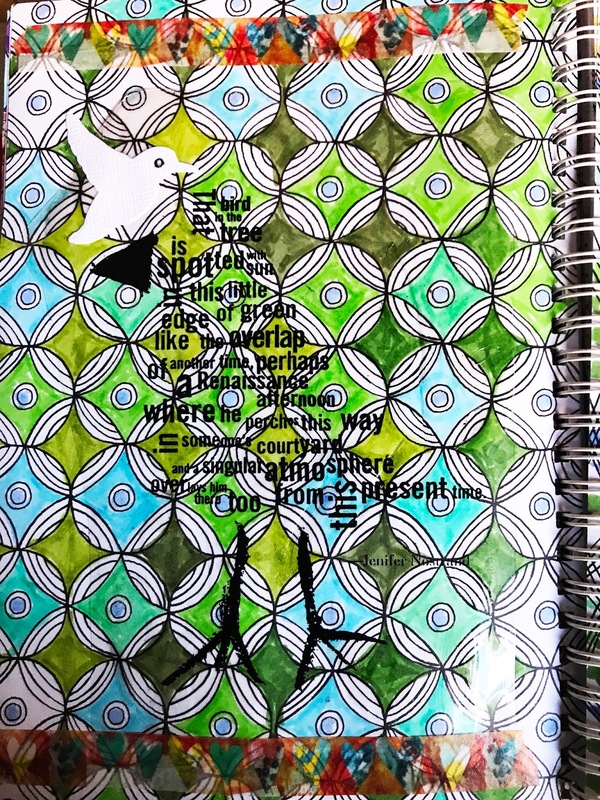 In this above piece, I didn't like coloring page so I covered it with lots of paper tape and added some stamped and colored figures (Dina Wakely stamps). I do like the effect of covering the colored tape with some white tape in the middle. It diffuses a little of the bold color. I hope everyone has a great weekend and that those of you in the cold get a little spring weather also. I was so happy that the Four'easter fizzled. I love how you make the color calendar really yours by adding your own art.Warmer weather coming mid-week so the snow pile will get a good melt. Have a great weekend! Love the pages from your calendar. The use of the white tape really does mute the colors nicely. 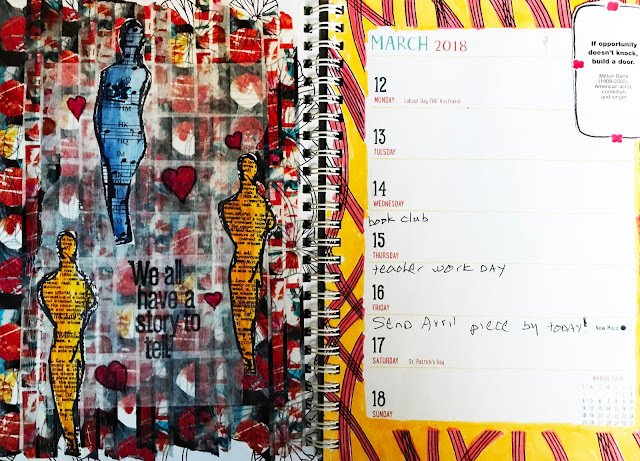 This is a clever way to combine art with your calendar. You did have a busy week - we had snow too - and it seems that the weekend will be busy. Enjoy having your daughter with you. second one is so beautiful in colors and patterns as well.I can imagine that it relaxes just to color in .... and then you make such fascinating artpages out of it! Well done ! I forgot till now to mention that I love the new header... tulips are my favourite flowers since I was a teenager. Maybe I have some Dutch genes in me??! I try to get hubby to gift me with the heritage gene test for Easter... so excited hope he orders it for me- we will see. I wish you a very happy weekend my friend- relax and enjoy the bridal shower ! Think your daughter and her hansome friend will marry soon as well- am I right??? Two fantastic pages Erika,the colours look great. I like colouring pages as well , its quite calming to sit with the coloured pencils and relax and like yourself, alter them to suit how I want them to look. You have had a busy week, Erika, and the roads looked a bit nasty the other morning, glad you were safe. Looking at the weather makes me glad I don't have to be out in it, but thankfully it melted soon enough. Enjoy the time with your daughter. I bypassed my niece's wedding shower last weekend as it was in NJ, but I sent a gift so all is good. I think your calendar pages are quite colorful and I appreciate the fact you have made them your own. SO glad you shared these, because they really made me smile. Sounds like an up and down week for you. I hope next week is better. And of course, I hope you enjoy your time with your daughter, too. I like your calendar concept. Every year a good friend and former colleague who is well into her 80s buys two Met art calendars, keep the one she likes and gives me the other. It's a lovely gesture but sometimes I don't like the calendars all that much. I should just take the pages I don't like and make my own! Maybe I will! I like the idea of a coloring calendar. You did some beautiful work, those Dina Wakley stamps fit in well. I hope school is not too stressful. The school shootings have added a lot of extra stress onto an already bad year (due to the October fires). I hope your school is doing okay. I have never seen a coloring calendar. That would be less intimidating to my non-artsy self than a blank page ;) I love how you adapted it to suit you.